The aim of this study was to investigate the opioid-sparing effect of a cooling brace after surgical correction of idiopathic surgery in children. We compared two consecutive cohorts of patients before and after introducing this technique in our institution. Management of patients was standardized. The primary objective of the study was to investigate the morphine consumption during the first postoperative day. Secondary outcomes were opioid consumption at day 3, pain intensity (at days 1 and 3), the mobilization in the standing position and duration of hospitalization. This study included 23 and 22 patients in the control and the cooling cohorts. Cooling brace was associated with a significant decrease in morphine consumption at day 1 (1.7 [0.9, 3.3] versus 1.2 [0.5, 3.2] mg kg−1, P = 0.02) and day 3 (2.5 [0.5, 6.7] versus 1.2 [0.9, 2.5] mg kg−1, P = 0.003), and a reduction in duration of hospitalization (4 [3, 6] versus 3 [3, 4] days, P = 0.004). 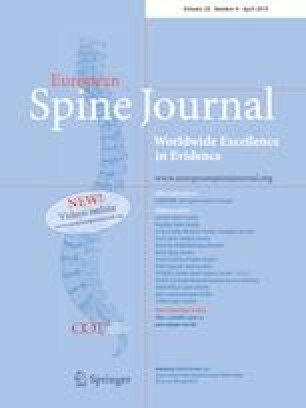 However, no difference was found on the pain intensity or the percentage of patient mobilized in the standing position. Number of level fused and intraoperative opioid consumption were also different between the two cohorts. However, multivariate analysis found only the use of the cooling brace as significantly associated with opioid consumption at day 1. The use of this cooling brace allows decreasing the opioid use after surgical correction of idiopathic surgery in children. The current results strongly suggest an interest of this technique in the postoperative management of patients. The online version of this article ( https://doi.org/10.1007/s00586-019-05886-6) contains supplementary material, which is available to authorized users. A correction to this article is available online at https://doi.org/10.1007/s00586-019-05950-1. MB: conceptualized and designed the study, included patients, collected data, corrected the manuscript and approved the final manuscript as submitted. DM: conceptualized and designed the study, included patients, verified statistics, corrected the manuscript and approved the final manuscript as submitted. NC: conceptualized and designed the study, included patients, collected data, corrected the manuscript and approved the final manuscript as submitted. TV: included patients, collected data, corrected the manuscript and approved the final manuscript as submitted. BG: included patients, collected data, corrected the manuscript and approved the final manuscript as submitted. BI: conceptualized and designed the study, corrected the manuscript and approved the final manuscript as submitted. KM: included patients, collected data, corrected the manuscript and approved the final manuscript as submitted. ALS: included patients, conceptualized and designed the study, collected data, verified statistics, corrected the manuscript and approved the final manuscript as submitted. EF: included patients, conceptualized and designed the study, collected data, verified statistics, corrected the manuscript and approved the final manuscript as submitted. FJM: conceptualized and designed the study, collected data, corrected the manuscript. SD: conceptualized and designed the study, designed the data collection instruments, included patients, carried out the initial analyses and verified statistics, drafted the initial manuscript, corrected the manuscript and approved the final manuscript as submitted. This study was funded by institutional resources. Pr Keyvan Mazda is a consultant for Zymmer®.